A variety of round up proposals are looming on the horizon effecting America’s wild horses and burros and we can safely say none of them bode well for America’s dwindling free-roaming equines. Here is a brief summary of what’s coming….. The following round ups propose to gather 2,972 wild horses in 9 Herd Management Areas (HMAs) over the next several months. If you submit comments, please include the name of the proposal and/or any EA#s provided and be aware that all information you supply, including personal information, will become part of the public record. While you can request that your personal information be withheld, in some instances, BLM may not be able to censor it from release. Last “official” round up occurred in 2002 but also had emergency fire removals in 2006. BLM proposes to round up 511 wild horses, remove 399 and leave 139. The public can support one of two options; using the experimental fertility control drug PZP or not on the released mares after the capture. Removals are expected to begin in July or August. The Owyhee HMA spans 338k acres with an approved population not to exceed 231 wild horses. BLM has allowed a maximum of 2,772 AUMs of forage for wild horses and 23,241 AUMs of forage for livestock with 2,500 head of cattle run from March 1st through November 30th annually. The Complex covers the Callaghan, Bald Mountain and Rocky Hills HMAs. BLM proposes to round up 1,680 wild horses, remove 1,409 and leave 359. 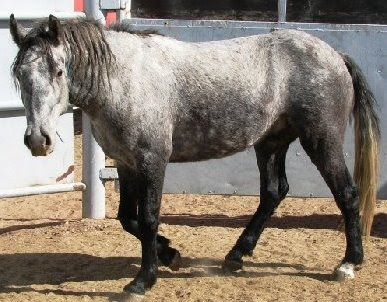 The round up is expected to occur in the fall/winter of 2008 and the public can support one of two options; using the experimental fertility control drug PZP or not on an estimated 136-163 released mares. The BLM may also conduct a Trapsite Adoption of wild horses at the round up pens. The three HMAs span 380k acres with an allowable population not to exceed 595 wild horses. BLM has allowed a maximum of 7,140 AUMs of forage for wild horses and 62,284 AUMs for the livestock allotments affecting these HMAs with a total of 29k head of sheep and cattle grazed at various times throughout the year. At present, it is not known what percentages of these allotments are actually in the HMAs. The Complex covers the Conant Creek, Dishpan Butte, Muskrat Basin and Rock Creek Mountain HMAs. The BLM proposes to round up approximately 515 wild horses but has provided no estimated removal or remaining numbers. The round up is expected to occur beginning October 1, 2008 and the public can support one of two options; using the experimental fertility control drug PZP or not on the released mares. The four HMAs span 375k acres with an allowable population not to exceed 536 wild horses. BLM has allowed a maximum of 6,432 AUMs of forage for wild horses. No information is currently available on livestock allocations in these areas. Last removed in 2004, BLM proposes to round up 266 wild horses (80% of the population), remove 150 and leave 162 in all alternatives. The Proposed Action is to shoot 45 mares with the experimental fertility control drug PZP and brand them with the Idaho state brand of AA. Mares that were given PZP in 2004 may be shot again and if so, a 1 will be added to their freeze brand. BLM claims that without using fertility control, wild horses will need to be removed again in two years. The Challis HMA spans 167k acres with an allowable population not to exceed 253 wild horses - the round up is expected to occur in summer 2008 and BLM has already signed the preliminary approval for the proposal. BLM has only authorized forage for wild horses to cover the low AML of 185 (2,220 AUMs of forage), not the high of 253. This is why BLM must use fertility control – because they have not issued enough forage to sustain the “high” AML but have given it to livestock instead. The Challis HMA has 6 livestock allotments affecting the HMA with 13,659 AUMs issued for livestock use with over 5,300 head approved to graze annually. AUSTIN, Texas — The State Parks Division of Texas Parks and Wildlife Department will host a public meeting on Thursday, June 12 at 7:00 PM at the Bellaire City Hall Auditorium, 7008 South Rice Avenue in Bellaire. The meeting will focus on natural and cultural resource management activities on state park properties, with a particular focus on management challenges at Big Bend Ranch State Park. Following a short informational presentation, the public will be invited to comment on current management strategies for removal of feral animals such as burros and exotic species such as aoudad sheep from the park and may offer alternative solutions and suggestions. The Big Bend Burros were the focus of intense controversy after officials began shooting the century old burro herds and leaving them to rot in the Park as officials now want all the Parks resources for exclusive use by the soon to be introduced tall dollar hunting species, big horn sheep. For more information on the Big Bend burro’s travesty, Click Here to read "Big Bending The Rules". The BLM is still accepting public comments on their Final Gather plan for the last 147 wild horses of the West Douglas HMA. Zeroed out after long and lengthy legal battles that ended on October 10, 2007, the BLM Director dismissed all protests of the decision (1) and now BLM is revving up their engines to take them out starting October 1, 2008 and will continue indefinitely until they are only memories. The Final Plan (or should we say Solution?) can be viewed by clicking Here and includes “humane standards” of limiting helicopter driving of the horses to 5 miles if snow is over a foot and/or canceling helicopter captures if temperatures drop to –10 degrees below 0. So we finally started getting some answers about what BLM considers “humane treatment”! The Cloud Foundation and Volunteer Executive Director Ginger Kathrens have posted her letter to BLM (Click Here to View) and is urging everyone to please contact BLM to voice your concerns. Only 4 herds remain out of 8 with a state “appropriate management level” of 812 wild horses, which means wild horses are allowed 9,744 Animal Unit Months (AUM) of forage per year. 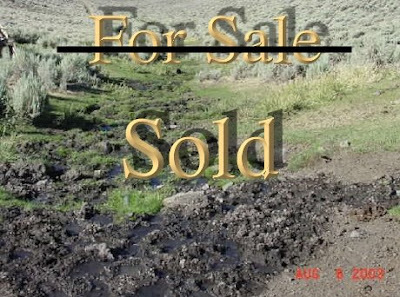 Just the White River Field Office alone, who authorized the irrevocable loss of the West Douglas Herd, doles out a generous 118,441 AUMs for exclusive livestock use totaling 41,478 head while the 60 wild horses that were considered too small to be genetically viable and therefore must be removed were issued 720 AUMs. One of the main livestock allotments occurring in the West Douglas HMA, Twin Buttes, was re-authorized by BLM in 2005 to run over 3,900 head of cattle totaling 11,500 AUMs. The other main livestock allotment in the West Douglas HMA is controlled by Cripple Creek Cowboy Company, proud recipient of over $77k dollars in livestock subsidies between 1996-2006 (3) but public lands statistics reports showing how many cattle are being run on his allotments are mysteriously “unavailable”. Anybody else think it’s funny that the Twin Butte livestock allotment, which spans 140k acres can support 3,900 cattle but the West Douglas Herd Management Area, which spans 128k acres can only support 60 wild horses? If you have any questions about how illegal this is, read BLMs Code of Federal Regulation 43 CFR 4710.5(a) Closure To Livestock Grazing, which states: "If necessary to provide habitat for wild horses or burros, to implement herd management actions, or to protect wild horses or burros from disease, harassment or injury, the authorized officer may close appropriate areas of the public lands to grazing use by all or a particular kind of livestock." Turns out Colorado Senator Wayne Allard (R) is a personal advocate for the permittees and has interceded with BLM on their behalf to make sure we know where the beef is. He is a member of 12 different subcommittees in the House of Representatives, including the Minority Ranking Member of the Subcommittee on Interior Environment and Related Agencies and keeps his fingers in wide variety of pies. If you would like to tell Senator Allard or other Colorado representatives just what you think of what they are allowing to happen to one of Colorado’s last remaining herds just to stuff a few more cattle, elk and oil wells on the land, Click Here for contact information. Unfortunately, American Herds has just found out about the comment period for the West Douglas Herd and there is almost no time left! If you would like to be herd, you must submit your comments by May 23, 2008 before 4:30 p.m. for BLM to consider them. EA# CO-110-2008-052-EA in your submission. Photo is of a captured wild horse taken from the East Douglas Herd. 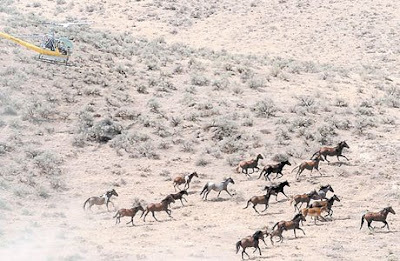 Last Thursday, the Nevada BLM conducted their annual hearing on the use of helicopters to remove wild horses and burros from public lands and public concerns finally made the local news. As to be expected, BLM continues to offer assurances that they take every precaution and humane considerations are at the forefront of their minds in all their decisions. Little surprise there, huh? They issued the same statement last year less than an hour after the hearing ended, then stating they had conducted a “thorough review” of round up procedures and public concerns and of course, determined all concerns were entirely unwarranted. Apparently, it took even less time this year as Nevada’s Wild Horse and Burro Lead Susie Stokke told local reporters the same story while outside the hearing room. 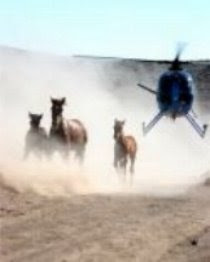 Notice while Susie Stokke states in her interview that humane considerations are the top of BLMs priority list, the first reason cited when they are showing wild horses being rounded up is BLM touting the efficiency of helicopter removals. After all, leaving them wild causes resource degradation, competition to other “users”, threats to wildlife and may cause “catastrophic loss” of life to the wild horses and burros themselves (this is BLMs newest statement to describe the depth of the emergencies used to justify efficient and expedient removals). Watch as Susie discusses how closely BLM monitors their activities and if anyone needs proof of just how close BLM watches range conditions or how concerned they are for their welfare, go back and read what happened at Jackson Mountain last summer. Of course, this was certainly the exception to the rule, as surely BLM will tell us. Why? Because BLM actually got caught holding the dead bodies, unlike the usual situations where the public is only allowed in on “approved days”, at “approved locations” during “approved times” when BLM conducts removals. For animal and public safety, of course….. Which is why BLM didn’t haul water to the wild horses for over two months, even when they were “ready to haul water” after they saw them “standing in troughs” – they didn’t see animal safety as a “need” then. And why they didn’t use water-trapping methods on starving and dehydrated horses but chose to use efficient helicopter removals because they didn’t see an animal safety and welfare need then either. But they certainly do see a need to keep a strict watch and a close eye on the public getting anywhere close to their “unapproved” removal activities. Like in January 2007 when local veteran investigative reporter George Knapp and the I-Teams helicopter was escorted out of “their” airspace and told not to come back when they tried to get some “unapproved” footage. Or when local residents in Cold Creek had arranged for their own independent population census after an allegedly illegal gather occurring that BLM and USFS shut down by citing “harassment” clauses. Or the undercover footage of USFWS 2006 Sheldon wild horse round up on American Wild Horse Preservation Campaigns website, undercover because they would not allow the public within 2 miles of the gather operations. Or the rumored cost of security forces at the Clark Mountain wild burro round ups in California in January 2007 reported to exceed $70k to “protect the safety” of the gather operations. Ironic that BLM can spend $70k to pay the local sheriff to keep the public at bay yet they could not afford to allow volunteers and volunteered materials to run a water pipe to keep the Clark Mountain burros from being irreplaceably lost. Fortunately, that $70k spent in keeping everyone safe was well spent as the Clark Mountain burros are now safely tucked into their adoption/for sale program. As Susie continues to spout BLM statistics to support BLM decisions, the questions posed to the National Wild Horse and Burro Advisory Board last July about humane standards continue to remain unanswered. While he has yet to issue any statement, offer any studies or provide any answers to these questions, Dr. Boyd Spratling, BLMs chosen representative for Veterinary Medicine for the National Wild Horse and Burro Advisory Board, current rancher and former head of Nevada’s Cattleman Association has provided the public with a recent snapshot of what he thinks is important to consider when questioning BLMs standard operating procedures with helicopter removals. Thank you Doctor for your very “scientific” insight into the subject. We are all looking forward to BLMs continuous assertions of just how objective and realistic they are while citing Symanski-1996 as their “scientific support”, aka, How wild horse and burro advocates are just TOO emotional and ignorant to be considered credible on the subject. In Janaury, 2008, Quarter Horse News published an article by Linda Hussa titled, "185 Wild Horses Dead" about the events that led up to the deaths of 185 wild horses rounded up by BLM from the Jackson Mountain Herd Management Area in August and September in 2007. On January 21, 2008, American Herds posted their own response to the issues raised in the article with a post titled Pure Propaganda. The next month, Quarter Horse News published BLMs response to their article via a letter written by Wild Horse and Burro Division Chief Don Glenn, which can be viewed by clicking Here. Reading Mr. Glenns letter, Nylene Schoellhorn, a wild horse advocate from Silver Springs, Nevada was inspired to challenge Mr. Glenn's statements with her own letter and reply. Quarter Horse News did not provide any format for people to comment about either article and so, in the spirit of sharing, American Herds has decided to provide a place for Ms. Schoellhorn's letter to Mr. Glenn. The views and opinions expressed by Nylene's letter are her own. I would like to reply to your letter regarding our American wild horses. First of all---for the Bureau of Land Management to 'manage' should mean---you DO NOT let the cattle ranchers fence wild horses off from the drinking water. Which they do here. It means you DO NOT let the cows have more land than the wild horses. Which the BLM allows here. The 1971 law states that wild horses have PRIMARY rights to their traditional lands. The BLM does not do that here either. There is now less then one wild horse for every 150 cows on our public owned lands. If you are so concerned about a 'wild horse population yearly increase' then have the BLM stop killing off all their natural predators-the coyotes and wolves and cougars. But the cattle ranchers would not stand for that -would they? 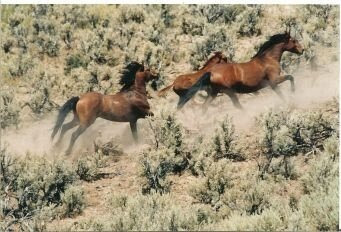 You state that the wild horses eat up habitat that place other wildlife species and livestock at risk. You MEAN- wild animals hunted on BLM land for sport and all those cows. A Big Horn Sheep hunting tag currently can sell for thousands of dollars. That is what you MEAN. A cow that is a private owned domestic animal that feeds on our public owned land for a token amount of money compared to what private cattle grazing land costs. That is what you MEAN. I have a solution. Quit allowing hunting on our public lands. Quit allowing cattle ranching on our public lands. Quit killing off all the natural predators. Problem solved. The "scientific fact" is that this is all about money. Wild horses don't make money. Unless hunters could shoot them. And the BLM knows the public would never stand for wild horse hunting. Nor will they eat them. Nor allow them to be slaughtered and sent to France, as which happens with our domestic horses. So the BLM considers the wild horses useless. As far as 'appropriate management level" goes-I repeat- there is now less than one single wild horse for every 150 cows on our public owned lands. (BLM statistic) One vs one hundred and fifty? How is this this figure in any way 'appropriate'? 'Natures Cruel Hand'? Is that what you think? How about the BLM's cruel hand? Instead of placing the wild horses in 'long term holding facilities' -why don't you round up and do that to the cows? It would make more sense. After all, they are domestic animals, raised to be slaughtered for beef. The reason that less that half of your budget goes for "managing wild horses and burros on the lands'' is because the MAIN focus of the BLM Wild Horse and Burro Program is removing wild horses and burros from our public range lands so there is more room for cows. We the people -would rather you got rid of the cows! Only 3 percent of America's beef is from cows raised on our public lands. Most of us would gladly do without the 3 percent beef and have more wild horses in the wild instead. There are no "excess wild horses" on our public lands. There are only excess cows! You round the wild horses up in terrifying helicopter chases where they are often injured and even killed. You keep no records of how many of these injured rounded up horses later die-and also die from eating too rich food they are not used to- (I have watched all this happen) -and place them in 'holding facilities" where they also get sick and sometimes die-you sell them however you can-$125. was the price last time I checked--and you NEVER check on how the newly 'adopted' horses are doing...and you promote the carefully worded '10 years of age' program-so they can then be sold to kill buyers who take them to slaughterhouses! You make no mention of any of this-but describe a death in the "natural setting" as cruel. You describe the wild horses as starving to death. The truth is-this is not a natural setting. This is a setting without the wild horses natural predators, coyotes and wolves and cougars,which the BLM is also busy hunting down and killing-after chasing them in helicopters and shooting them or poisoning or trapping them...as a favor to the cattle ranchers (and with our tax money). You also don't mention that when a wild animal-such as a wild horse-lives and dies on the land, its body stays on the land, and nourishes the land and other animals. That seems a much better death than being rounded up and hauled off in crowded trucks to a slaughterhouse to be stuck with electric prods and have a metal bolt gun slammed into your head and then your throat cut open and hung on a hook to bleed out....which is what you have promoted for wild horses over the age of 10. You speak of 'economic harm' to ranchers and rural communities. There it is. There it is the bottom line-this is all about money. The truth is, most cattle ranches in the west are now owned by huge companies and stockholders back east-not small family ranches. Paris Hilton's family is one example. Poor hardworking ranch owners! In any case, cattle ranching is a dying industry. More and more people are realizing that eating beef is not good for our environment, our health, or our economy. A wiser course of action for the BLM would be to look to the future-to promote Eco-Tourism of our public owned lands. Come visit with cameras-not guns. Wild horses do not need to be 'managed'. All they really need is to be left alone, along with all the other wild animals, on our public owned lands. The BLM manages over 5 million acres of land. Surely that is enough land for viable herds of wild horses to run free, (without chemical birth control, castration or roundups) as the 1971 Wild Horse Act states. BOYCOTT BEEF! IT IS WHAT IS KILLING OUR WILD HORSES AND PUBLIC OWNED LANDS! In Mike Hudaks' Western Turf Wars – The Politics Of Public Lands Ranching, an interview with Mike Sauber sums it up in a nutshell and what he describes should send chills down anyone’s spine who cares for America’s resources, “our” public lands and why the current system has eternally doomed us to failure until there will be nothing left but dust. If you really want to know the truth about America and our resources, Western Turf Wars is just an amazing public service. If you already care about what you see going on around you, it has incredible insight on multiple levels as to why our public resource system is such a mess. If you didn’t give it much thought before, by the time you finish this book, you might find yourself suddenly caring very much! To order a copy or read other reviews of Mike Hudaks' Western Turf Wars – The Politics of Public Lands Ranching, Click Here. The photo above was taken from the Simpson Park Complex Rangeland Health Evaluation published by BLM in 2005. The original photo was of Barton Creek in Nevada taken in August 2003 and all the damage was attributed exclusively to excessive livestock grazing. It is one of hundreds, if not thousands of our "natural springs" and what's left of them.